When it comes to money, all of us have made a few foolish mistakes now and then. It’s the car we can’t afford, the personal loan we should’ve never made, or the mortgage that nearly sent us to bankruptcy. So why do we keep making these same mistakes? Most likely, we mismanage money because of a faulty belief system—something we learned from a parent, teacher, friend, or even the culture as a whole. While it would be easy to sit back and blame others for falling for these myths, the most important thing to do is realize they are myths in the first place. Recognize them as myths and move on from there. Some tools help you fix things. Other tools help you break things. So, in that sense, debt is a tool—consider it a sledgehammer to your financial future. Another way of putting it: Debt is the enemy of your income. The monthly payments you send to MasterCard are monthly savings you could be putting toward your retirement, your kids’ college and a down payment on a new house! 2. Car payments are just a way of life. If you believe debt is a tool, you’re just as likely to believe car payments are a way of life. The average car payment these days is nearly $500 per month. That’s $6,000 per year you’re putting into something that decreases in value. Instead, save that $500 per month and buy a nice, used $6,000 car in 12 months. The best cars are paid for with cash. 3. Uncle Jim will pay me back. Loaning money to family members is a terrible idea. It rarely gets paid back. (After all, you’re family, right? You’ll understand.) And, if it does, the time in between always makes for awkward family dinners. When Uncle Jim mentions his upcoming Christmas vacation at Thanksgiving dinner, you’e left wondering, Wait a minute. You still owe me $500, and you just paid for a Christmas vacation? If you’ve got the money, then make it a gift. Never make it a loan. Loaning money to a family member is one of the quickest ways to ruin your relationship. You can. You absolutely can. Will it be easy? Probably not. Will it be worth it? Totally. Whether it’s college-specific aids and grants, federal or state aid (that’s grants and scholarships, not loans), going to college without debt is absolutely possible. And, oh yes, what about paying for college out of your own pocket—or making your upcoming college student do just that? Rachel Cruze talks about this topic all the time. There are plenty of alternatives to loans when it comes to funding college tuition. 5. I’m too young to worry about retirement. If you’re out of college, then you’re not too young to worry about retirement. Our only guideline for retirement savings is that before you start, make sure you’re out of debt and have an emergency fund of three to six months of expenses. After that, you’re ready to start building for your future. Too many 30-year-olds believe retirement isn’t relevant to them. It’s more than 30 years away! But the truth is, retirement is as relevant at 35 as it is at 65. The more you save now, the less you’ll worry later. Our friend Chris Hogan explains how you can retire a millionaire on $10 a day. 6. I keep track of my money, so I don’t need to budget. If you go online and know about how much you have in your bank account, that’s great. But that’s not a budget. When you track your spending, you’re looking backwards. You’re looking at how you spent your money. A budget looks forward. You plan on how you’re going to spend your money. Too many people think they budget simply because they have a general understanding of what’s in their bank account. When you budget, you plan ahead for each month’s expenses. You give every dollar a name. 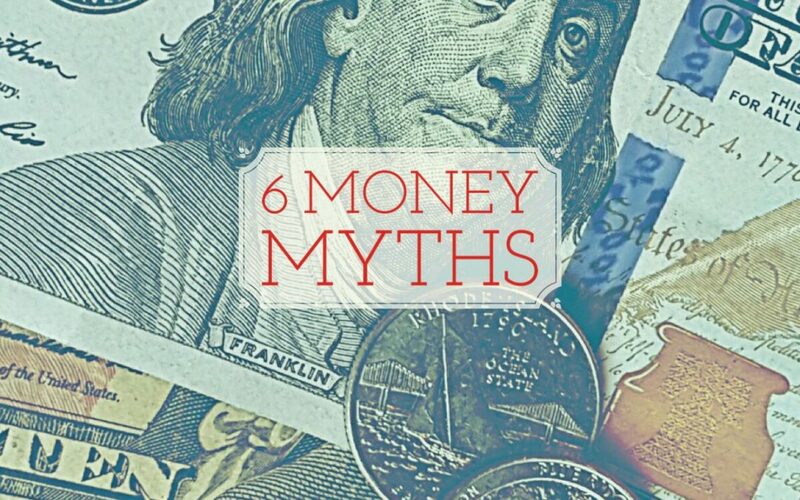 You don’t have to fall prey to these foolish money myths. Make this April the month you start taking control of your money for good!